HEAL THE DIVIDE ON CAMPUS will be presented by the University of Texas at Arlington, Department of Theatre Arts on March 30th from 1pm-3pm in the Art Gallery. It is comprised of original one-act plays written and performed by students from the Department of Theatre Arts. The pieces focus on topics that directly concern and impact or speak to the millennial generation, such as suicide in the LGBTQ+ Community, Sexual Abuse, the Black Lives Matter movement among others. 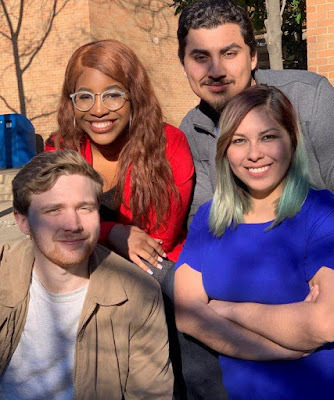 HEAL THE DIVIDE ON CAMPUS project is presented in conjunction with colleges and universities across the U.S. that wish to begin conversations about issues concerning their community through the lens of the student playwright. A key to the event is to get local with the material, and to share insight into each community’s current issues of concern. Participating colleges and universities include: California State, Long Beach, Iowa State University/KCACTF region 5, Southern Arkansas University, University of North Carolina-Charlotte, and Wake Forest University. HEAL THE DIVIDE ON CAMPUS is presented by a group of students writing plays representing the University of Texas at Arlington community including junior Nancy Palacio, freshman Devin Sternes, junior Jonathan Ramirez, freshman Dragon Tran and senior Straton Rushing. The supervisor and coordinator of the group is Theatre Professor Detra Payne. This free event promises to be moving and enlightening.